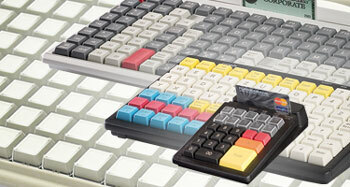 PrehKeyTec special keyboards provide solutions for all professional applications. No matter whether they are used at the cash desk, in restaurants or with applications for medical engineering or special studio equipment, their easily programmable keys offer the highest ergonomics and flexibility. Jarltech is official distributor for PrehKeyTec in Europe and delivers you not only the complete keyboard line, but also supplementary PrehKeyTec peripheral products for POS and special applications overnight, directly from stock. PrehKeyTec is a large German manufacturer for first-class mechatronic components used in various fields. Not only known for their cash register keyboards, they also supply to the automotive industry and manufacture automation systems, electronic components, sensors and converters. Industrial use requires keys and switches of highest quality like those that are also used in the range of programmable PrehKeyTec POS keyboards. Because of their industrial components, PrehKeyTec keyboards satisfy the highest demands on durability and integration. Jarltech offers you a wide range of PrehKeyTec special keyboards – always at astonishing low prices. You will always find a programmable keyboard that suits your application – 30 to 147 keys, with or without card reader. Additionally, you obtain suitable accessories from us, such as key caps and tools for inserting and labelling the keys. Only with Jarltech can you offer your customers PrehKeyTec keyboards with Jarltech one-click Service contracts – like with all products you can extend the warranty or buy an optional Advance Replacement Service: if your customer experiences failure of the devices during the warranty period, we will send him a replacement immediately. The defect unit has to be sent in only after the replacement has arrived. On request, you may also receive individually laser-printed key caps. Custom-made key caps can make operation significantly easier, as is often seen at petrol stations, supermarkets or other retail shops. PrehKeyTec hardware and accessories are always available from stock and are delivered within 24 hours to your location.